These instructions are preliminary. Final instructions will be published at the competition center on Sat 9th June 2018. We thank the land owners for the opportunity to organize these games in the Pinsiö surroundings. The competition will take place partially on conservation areas. The permission to do so has been granted by the Centre for Economic Development, Transport and the Environment of Finland, among others. Orienteers know how to keep the environment clean. Please make sure that no litter is left behind by your visit. 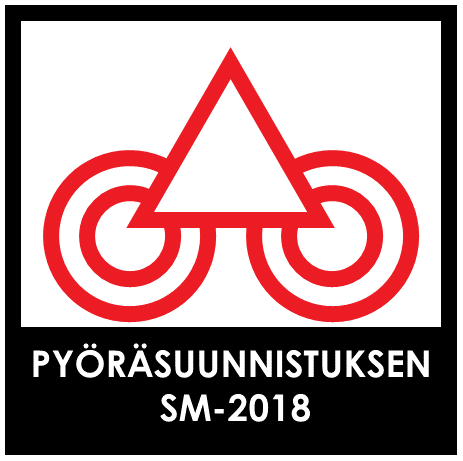 The competition will abide by the rules and specific regulations of the Finnish Orienteering Federation (FOF) and the competition rules of the organizer. It is mandatory to use a helmet. Riding off track is allowed. The competitors must abide by general traffic rules and the directions given by officials when they cycle on general roads amongst other traffic. When encountering competitors, give way from the right. The competitor must give way to a faster fellow competitor when hailed. Special caution must be used when crossing general roads. Right-hand traffic is used in underpasses. The competitors must note that the area is used by other outdoor travelers as well. Address of competition center: Sasintie 555, Hämeenkyrö, Finland. Road signs begin on route 3 (Tampere-Vaasa) at the Pinsiö crossing (address: Vaasantie 900, Ylöjärvi, Finland). The signs are on place Sat 9th June from 9.00 a.m. on. Entrance to the competition center is allowed only from the guided route. Those participating in the Finnish national championship competition in mountain bike orienteering (MTBO) are guided to the closest parking lots to the competition center. Traffic supervisors will separate the arriving cars according to the bikes they see. If your bike is in the trunk, please tell the supervisor that you are a cyclist. The sprint competition is held in the ridge terrain of Pinsiö that consists of three terrain types: thinned-out mixed forest, a sand pit area and fresh and dry coniferous forest. Where there are forest machine tracks or gravel based areas and in the car safari area, the trails are fairly soft. The fastest trails are in the forest area. The road Sasintie that crosses the competition area is forbidden in certain areas. Please abide by the instructions on the map. Legitimate crossings are supervised. The sprint courses offer both technical and skill-challenging orienteering in a versatile terrain. Personal speed must be regulated according to the terrain in the sprint courses. The long distance competition is held in an ideal mountain bike orienteering terrain. The ridge terrain offers fast narrow trails, wide tracks for physical exercise as well as technically challenging trails. Every course has plenty of contour intervals, which makes route choices essential in a well executed long distance performance. There will be drinking stops that are marked on the map where the organizers offer water. The competitors may also fill their water bottles with the organizers’ water. Courtyards are forbidden areas. Additional forbidden areas are marked on the map. Competitors that use forbidden areas are disqualified. MTBO printed map 6/2018, mapping: Markku Rissanen and Elias Kuukka, map finishing: Mapline, printing: Grano. Sat 9th June in the sprint competition, the scale is 1:7500 in all classes, contour interval is 5 meters and the size is A4. The map is exchanged in all classes. The competitors will receive both maps at the start stapled together. Sun 10th June in the long distance competition the scale is 1:7500 for classes D55-D80 and H70-H80, contour interval is 5 meters and the size is A3. In other classes the scale is 1:12 500, the contour interval is 5 meters and the size is A4. There is a map exchange or several exchanges in all classes. The numbering of the controls will continue from the numbering of the preceding map. The competitors will receive all the maps at the start. They will be stapled together. Some new tractor paths were updated on the map in the spring. The congruence of the speed of the map and terrain has been checked, and the track markings have been made to resemble the terrain as well as possible. Forbidden areas and roads, as well as any obstacles for advancement, have been marked in the map. Control codes are identified on the map after the control numbers. Course lengths are estimated to be close to the upper limit of the times provided in the guidelines. An EmiTag swiping system is used in the race. For anyone who does not list an EmiTag number, the organizers will reserve a rental EmiTag that will be available from the Info-desk of the competition for 8 euros (payed in cash). The organizer will charge an extra 5 euros for changing the number. If a rented EmiTag is not returned, a 90-euro fee will be charged. A model control will be presented at the competition center. The EmiTag-band can be tested at the model control. The functionality of the EmiTag-band is the responsibility of the competitor. Please check the starting list to make sure the number on the EmiTag band is correct. A false EmiTag number must be changed at the Info before the competitor goes to the start line. Checking the EmiTag number is the responsibility of the competitor. Competing with a false EmiTag number will result in disqualification. A control flag and a coded EmiTag device will be placed at the control. The controls will be placed beside the cycling track and punching is possible without stopping. The EmiTag device and code will be attached on a tree or post, and the control flag is located underneath the device. Please do not knock against the punching posts. Posts must not be leaned on or otherwise pushed. Punching is possible from both sides of the post without touching it. All competitors will use a bib number that is fastened on the bike’s handlebar. The number and means to attach it are available from the Info-desk. The bib number will be used in both the sprint and long-distance competition, after which they will be gathered at Sunday’s finish line. Cyclists that will only compete on Saturday will return the bib numbers to the Info. A fee of 20 euros will be charged for a missing or unreturned competition number. Designated competitors in classes D21, H21, D20 and H20 will use a GPS device. A list of those competitors will be published on the competition webpage. Using the GPS device is mandatory. It must be carried in a vest assigned by the organizers (the vest may be under the cycling shirt) or it can be attached on a map holder. The device may also be held in a pocket of a cycling garment, if there is a separate GPS-pocket with a zipper. The device and vest are available from the start, 15–10 minutes before one’s start time. There is a tent for changing clothes at the start line. The competition will broadcast on the Internet on Saturday and Sunday and will be available during and after the competition. The link to the broadcast will be published on the competition pages. The link to the GPS tracking will be published when the last competitor has departed. The first departure will be at 12.00 a.m. The distance to the start will be approx. 3.7 km – please check the color for your marked route to the starting point on the quidepost at the competition center. Do not deviate from the marked route. Please reserve a sufficient amount of time to get to the start; the marked trail is very time-consuming. The organizers have timed the distance at 25 minutes with a slow tempo and partially by foot. Warm-up is allowed only on the marked route to start. There is no toilet at the start, nor is there any transportation for gear from the start to the competition center. Older competitors may proceed to the start with their own transportation (precise instructions are given at the Info). This possibility is offered only for those competitors whose competition distance is the same length as the distance to the start. The competitors cycle approx. 400 meters from the car to the start. Note: Drivers, be aware of heavy traffic on the highway! First departure will be at 10.00 a.m. The distance to the start will be approx. 3.6 km – please check the color of your marked route to the start from the guidepost at the competition center. The marked route is via a paved road. Do not deviate from it. A warm-up area is in the courtyard of the start and to the northeast on the cycleway. The competitors may use the underway and cross the highway to warm-up on the other side as well. 4 min, call to start. Competitors must use helmets. A forbidden area has been marked near the last control on the map and in the terrain. That forbidden area is for the simultaneous foot orienteering competition. The marked line in the terrain continues slightly longer to the north than it has been marked on the map. A marked line will lead from the last control to the finish line. The performance will be timed according to when the finish line is crossed. After this the competitor moves according to instructions to the EmiTag checkpoint. The wailing wall is at the EmiTag checkpoint. The finish is closed at 3.30 p.m. on Saturday and at 3 p.m. on Sunday. The competition maps are gathered at the finish until the last competitor has departed. Competitors who drop out of the competition must register at the finish and go through the EmiTag checkpoint. Any complaints must be reported to the competition management within 10 minutes after the last competitor has arrived at the finish line at the latest. In the Finnish Championships, the three best competitors will be awarded with championship medals. Furthermore, in classes H21, D21, H20, D20, H17, D17, H15 and D15 plaques will be awarded for competitors in the places 4-6. In addition, honorary prizes will be given. The time of the prize giving ceremony will be announced and published on the bulletin board and result board. There is an open class on both days after the competitors have departed. The registration and map fee (12 euros) will be paid at the Info, where a preliminary departure time will be allocated. The starting points are those of the Finnish championship starts. An EmiTag band (8 euros) and a map holder (5 euros) can be rented at the Info. Please register at the Info for open class on Saturday before 1 p.m. and on Sunday before 11 a.m. Note: The same EmiTag band cannot be used in the open class and the Finnish national championship competitions on Saturday and Sunday. Please ask for further information in english at the Info, if needed. There is soup, juice, coffee, donuts, bread rolls, sweets, hot sausages and crepes for sale at the restaurant. Pinsiön kyläkauppa, a small village shop is open near the competition center. It sells, e.g., ice cream. There is also a village festivity at a nearby lean-to, where you can socialize and buy, e.g., crepes from 1.30 p.m. on.